This gorgeous girl is Lyla. 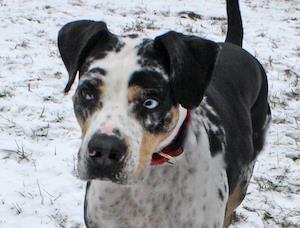 She's a 5 year old Catahoula Leopard Dog mix. Lyla is looking for a forever home where she can be the only dog. She's love a simply and laidback life with a consistent routine. Hi there! I'm Lyla. I'm a sweet, somewhat shy, simple sort of dog who just wants a quiet and calm home where I can enjoy life with my family. That's it. I'm well behaved, easygoing, sweet natured, and sort of independent. I won't ask for much, and I'll try my best to follow all of your rules. It makes me sad that I'm homeless yet again, but I understand. I'll get through this and my life will be better than ever! 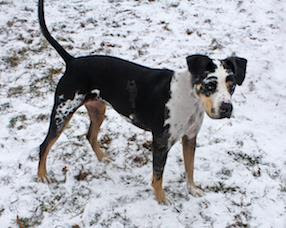 I'm a stunning, 56 pound, already housebroken and crate trained, Catahoula Leopard Dog mix. Have you heard of my breed? We're unique and special, frequently with one blue eye and one brown eye, which I have and I like to show off. I'm also true to my breed in that I'm loyal, protective, and athletic. I've had sort of a rough go of it though. I found myself homeless a couple years back, living at the shelter in Clinton, MO. I was transferred to Wayside, where I was adopted by a nice family. Things didn't work out for me there though. My family loved me very much and had lots of great things to say about me. But I liked to pick fights with my dog brother over all sorts of silly things. My dad was afraid that the 4 year old little girl who lived with us would get caught in the middle of things, so he decided that I would be better off with a new family. I didn't mean to cause any trouble, but I'm grateful that I'm back at Wayside, so that I can find you. And now we know that I'm looking for a home where I can be the only animal. No other dogs or cats for me, please. I'm a quiet and super sweet dog who doesn't really like to be the center of attention. Oh, with my family and close friends, I bond deeply and am very affectionate. But I'm shy and reserved around strangers. I'm looking for a new home with a quiet and calm energy, so that I can just relax and be myself. I'm happy at home and I don't need lots of adventure in my life to keep things exciting. A nice night curled up next to you on the couch is all the excitement I need. I do enjoy going for a walk or run and I'll be a great exercise partner for you. I do very well on my leash. And while I don't particularly like other dogs, I'm not reactive at all when I see them during walks, as long as they keep their distance. I'm not the sort of dog who will enjoy trips to the dog park though. Outdoor play in my own backyard is fine with me! I'm a smart gal and I've already had lots of training, so I can't wait to show you everything I know. I love treats and toys and it makes me so happy when you praise me, so I'm an easy dog to train. Please just be patient with me as I get acclimated to my new home, and remember that I'll pick up on things quickly. If you give me praise when I'm a good girl, I will quickly learn what you expect and will be sure to repeat my good behavior. Knowing I am making you happy will build my confidence, too. I'd like to meet the whole family before we all go home together. I lived with a 4 year old, but I might be happiest in a home with older kids, since I can be shy and I like people in my space on my own terms. And again, I need a home without any other animals. I long for a home and a family to belong to and hang out with. I'd love a simple and laidback life with a consistent routine. And I will make a wonderful, loyal companion for you! That's my purpose in life...to be your dog and to make your life happier, just by having me in it. I will be so good at that! Please come out to meet me and give me the chance to shine! Lyla's adoption ID number is 20678836. But hurry! This is the final Tuesday's Tails Blog Hop. They are cool dogs. We've met a few in person at the dog park. What a sweet face and and adorable expression. We'll share! What a gorgeous girl! I'm a sucker for a tri-colored hound! I've got her set up to share via Triberr!